David with a lean, mean, fighting machine, which really bent the Avon. I returned to The Other Pool today, in the company of my brother, David, and we hoped for a red letter day to perhaps match the emerging autumn colours. Summer was in evidence too, with still and warm conditions, as swallows skimmed the surface, after flies or a snatched drink of water. We had been told by the pool's owner that it had been little fished over the summer and was very overgrown. That suited us fine, naturally. I don't understand why so few members fish the pool - hardly any! Which is wonderful, of course, and a glimpse of how carping must have been forty or fifty years ago, when the pursuit was not so popular. The pool is tree-lined, and there are many snags; but it was stocked three decades ago, and then it was virtually left, unfished; and its immaculate commons are also a real glimpse of bygone days. I would love to get a twenty from there - the largest I have heard of was 26lbs, some years ago, and I believe the account. Now that's a huge "naturally grown" common by anyone's standards; but I digress. The water-level was a little down, but not to the extent that angling would be too difficult. Dave started off in the Pipes Swim, - a wise choice, which soon had him striking into, playing and unluckily losing a good fish, due to a hook pull. 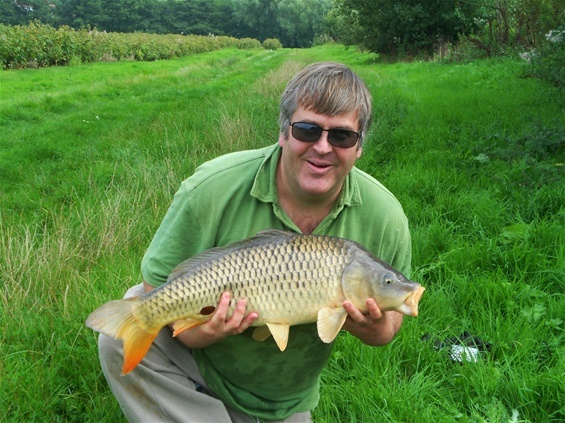 But he was soon landing carp, including a lean, mean common which really put up a grand battle. 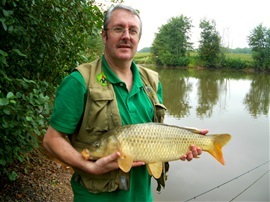 David is a consumate waggler angler, and his Avon tactics, using only 6lb line, really started to pay off. He was troubled, however, by the very small carp that have mysteriously appeared in the pool this year. The club says the pond has not been stocked, but we cannot help but wonder! He was catching "one a chuck" at one point. He was using pellets and particles, to try and feed off the smaller fish and to bring the bigger ones in. I opted for large baits on a size 6 Nash Fang Twister, and a stalking approach. I started off at the island, - soon landing a modest sized common and a "baby". Then we noticed carp leaping close in, off the far bank, and I decided to move. Another modest sized common fell to my rod in the bay, and a move to a very tight, tangled swim, a few yards up, led to me striking into a chunky double. Close in, it felt as though I'd struck into the bottom for the first few seconds! I was fishing through a gap only about 3ft wide, with snags to the left and snags to the right, so my Avon really took a close-range hammering, with back-winding and holding the order of the day, - except when the common made a determinded run towards the middle, against the Mitchell's clutch. I was more than pleased when Dave - great brother that he is - crossed the dam to do the honours with the net, - it really was a tight and tricky spot. I had another fish, shortly before leaving for home, on a huge hunk of prawns, and Dave came over then as well, - beyond the call of duty, as they say! We ended up with six decent carp between us, and a number of "baby" carp to boot. In fact, David lost count of how many of those he caught, but his tactic was always to fish through the small stuff to get to the bigger stuff, and it worked well for him, in fact. It was a wonderful day with great company - and was really one of the the most enjoyable sessions in years. A chunky double - no doubt one of the better carp seen leaping close in, beforehand. 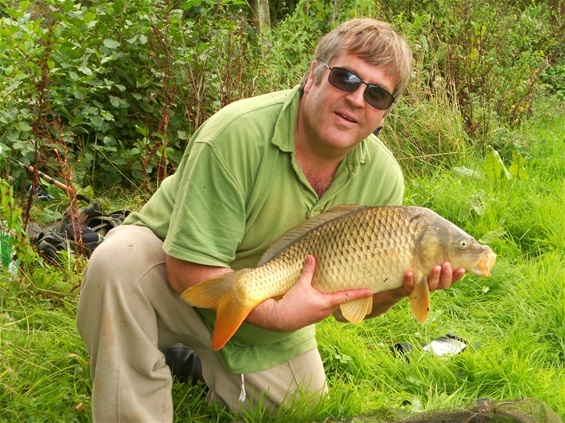 A large ball of breadflake did the trick, fishing in conjunction with a sight-bob. Sounds like the small carp in the Glebe are Dink crossed from Pixley not natural recruitment from the Glebe. Sad, silly and illegal! !